G’day and welcome to the Island of Single Track heaven. Your guides will do a group pick in the morning, before allocating bikes and helping people put their bikes together for those who have just arrived. A quick picnic lunch while we’re organising the bikes, before we leave the city behind and blast off to experience our first Single Track ride of the trip. Today we’re going to ride a lesser known track called the Wharfedale, offering a good slice of technical riding, with short climbs and super fun flowy descents. 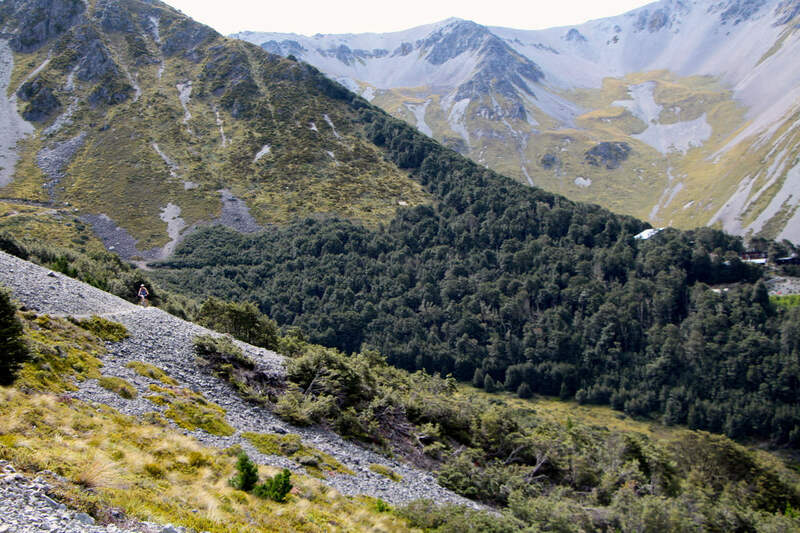 This track weaves through classic native forests opening up to picturesque views across the Canterbury plains. After the ride and a cold brew, we’ll take a short drive to our accommodation for the night set in a small country town in the foothills of Canterbury. Your guides will set up a good BBQ, while we go over the next 4 days of our awesome mountain bike adventure together. Today we’re up early as we set off to Castle Hill basin, home to the Craigieburn Mountains and some of New Zealand’s best single track. We’ll spend a good day taking in 4 of the best tracks starting with a shuttle, and allowing us to tag on each track one after the other, making for a primo day in the saddle! Starting off with a punchy climb on the Lynden Saddle, and then linking on to a super flowy and rooty track called the Luge. From the Luge we’ll tackle the scenic and incredible trails that wind through classic Beech trees and grand vista’s known as the Draccophyllum and Hogsback Track. Its single track bliss in one good hit! After riding, we’ll hit the open road to the town of Greymouth on the Wild West Coast. Off early today as we embark on New Zealand’s newest and longest backcountry single tracks known as the epic “Old Ghost Road”. We’ll ride a part of this beauty trail and offer riders a chance to add an additional Heli Bike today if the weather permits! Those keen on climbing and saving a few bucks can ride up the track starting in the old gold mining settlement of Lyell. It’s a sweet well graded climb through native forest, eventually opening up to stunning views over the Lyell Mountain Ranges. For those living large and opting for a Heli Bike, you’ll be dropped off on a ridge close to the epic “Goat Track” where you can continue riding to Ghost Lake Hut. Once we start heading back we’re in for a slice of NZ’s longest downhill of 26 km’s of flowing single track! 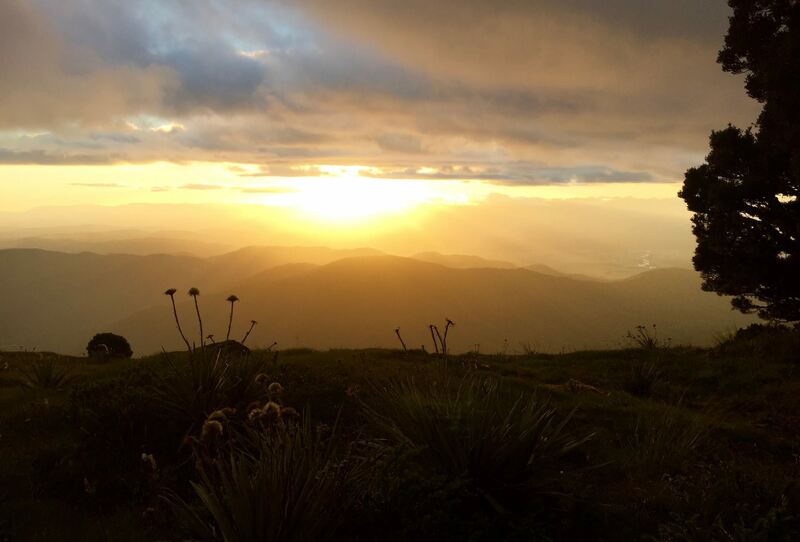 When we get back to the van, we’re off to Reefton where we will chopper up to the top of the Victoria Mountains to a sweet backcountry hut, where we’ll spend the night. Just think…Two choppers in one day? 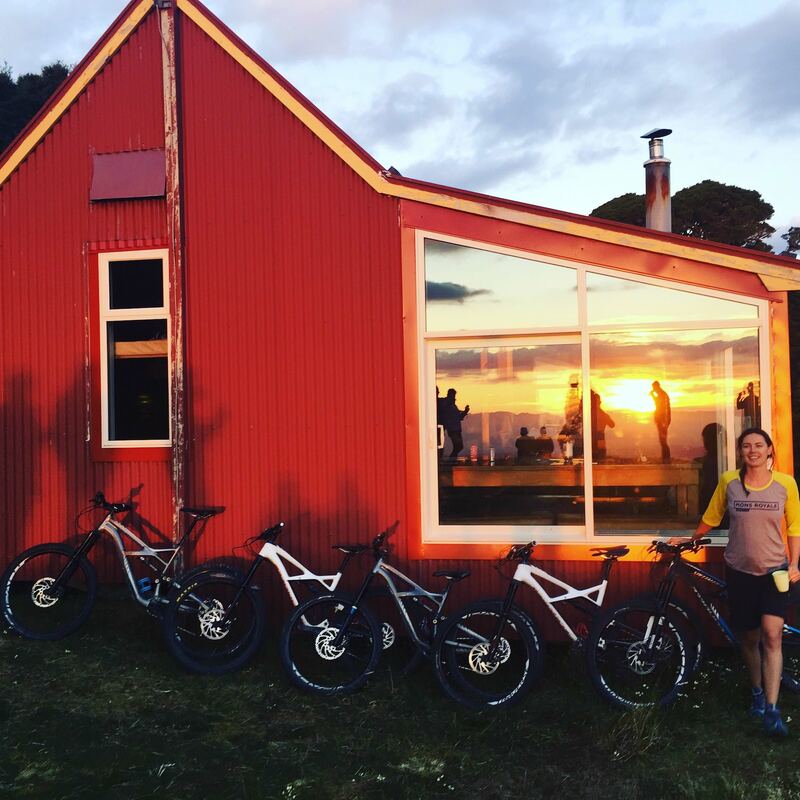 Awesome sunsets and technical mini rides around the hut, offer some killer opportunities for photos this evening. Chill back with a cold one, while you embrace this epic day in the Southern Alps backcountry. 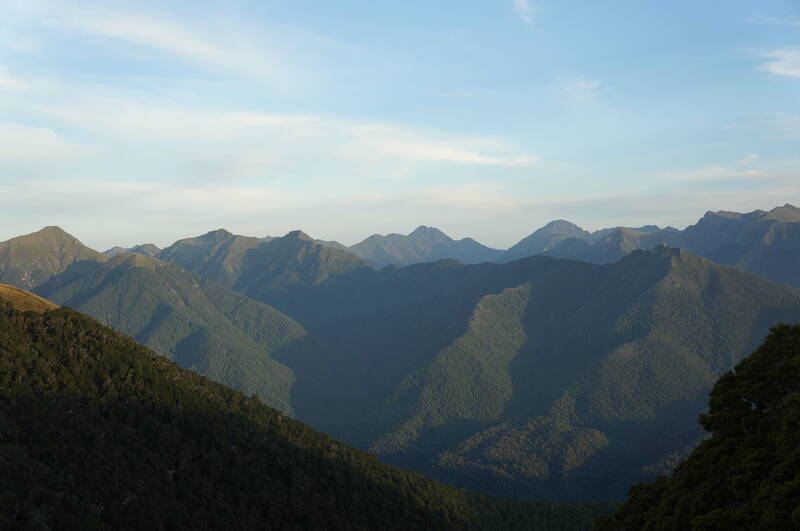 Rising to the sun peeking through heavily misted mountains bordering the Paparoa ranges, this is one sight to remember! After a good brekky it’s time to pack up our gear and hit one of New Zealand’s most classic backcountry single tracks, inclusive of an 1100 M descent known as Kirwans Track. This adventure ride will keep you in check as you practice your skills manoeuvring your bike through heaps of roots, drops and tight corners. Add a few hike a bike sections in there, and it’s on! 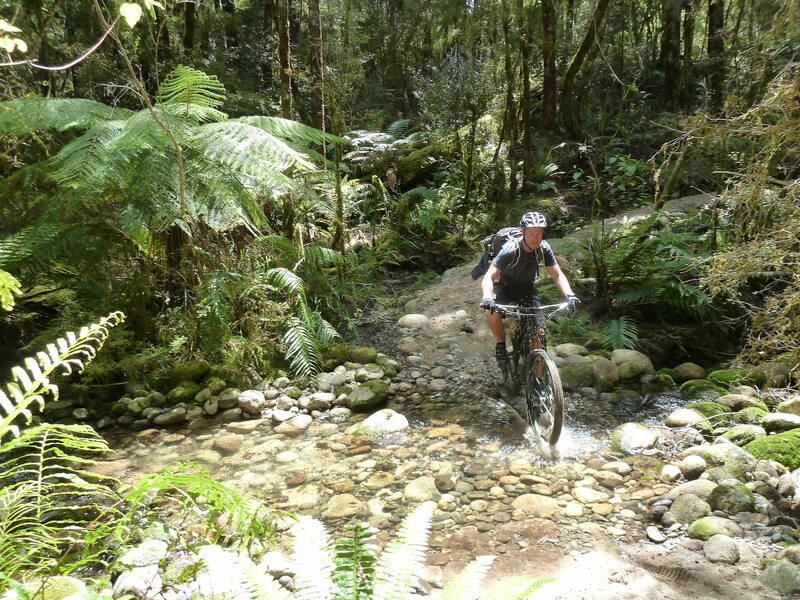 Kirwans Track is a lesser known gem found in the Victoria Mountains that still offers an authentic rugged Kiwi single track experience. After our ride we’re on the road, over to the East Coast to soak our riding muscles in some Hot Springs in a small town known as Hamner Springs. 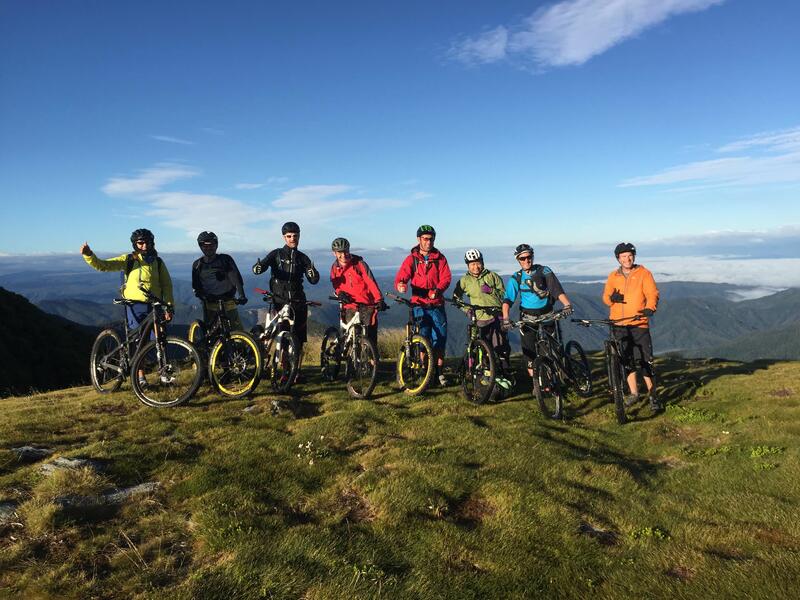 An afternoon ride is on the menu for those still keen to ride as Hamner Springs has some local fun tracks! This evening is our farewell dinner together as we re- live some adventure highlights of our short and sweet single track getaway! Last morning of the trip, and we have a short 1.5 hour drive back to Christchurch. Your guides will have you back to civilisation by 12 pm, or to the airport for catching a flight home. Flights should be booked after 2pm, allowing for 12 pm check in.